This is one of those books where I seriously suggest you just go get yourself a copy instead of reading my review – the book is an amazing, up to date, enthralling read that had me riveted from start to finish. Myles Munro is a brilliant character, a highly intelligent misfit, expert analyst of military history and something of a maverick. He’s absolutely awesomely different! The knowledge and expertise of the author shines through in this superbly written, highly topical, action packed thriller. I’m putting down the modern day port in Rome to artistic licence….It is a roller coaster, highly emotive and fast paced thriller. Journeying through the historic demise of the Roman Empire to ascertain threats to modern day America with migrants, terrorists, threats to the economy, kidnapping, murder, biological threats, this story has them all – and lots more besides! I hadn’t read anything by this author before but he’s now one I’ll certainly be looking for in future. The story has a well crafted, intricate and believable plot with so many unexpected twists and turns it will keep you (figuratively) on the edge of your seat. Even the final episodes have surprises in store for the reader! I’m going to get a copy of the earlier novel in this series and will certainly be looking out for any future works by this highly talented author. If you enjoy suspense, mysteries and thrillers this is a not to be missed novel, one I can’t recommend highly enough, totally stupendously, suspense filled and brilliant thrilling read. Reblogged this on Books by Iain King. 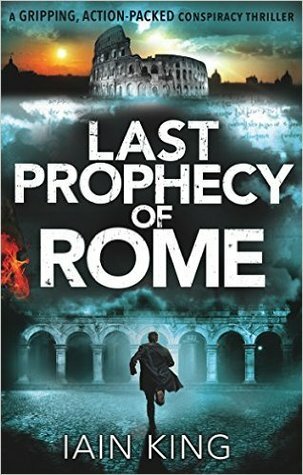 This entry was posted on January 30, 2016 by bicted in Adult and tagged 5*, Adult, Adventure, Bookouture, Contemporary, Detective, Iain King, Last Prophecy of Rome, Life and Living, Mystery, Series, suspense, Thriller.